The President of the Republic, Barham Salih, received an official invitation from his Egyptian counterpart Abdel Fattah al-Sisi to attend the Arab-European summit, while stressing the importance of upgrading the relations between Iraq and Norway in the service of common interests, discussed with the Vice-President of the Kurdistan Regional Government Qubad Talabani the relationship between the federal government and the provincial government And how to improve them. Saleh received the Egyptian ambassador to Iraq, Alaa Mousa, noting that "the President of the Republic received an official invitation from his Egyptian counterpart Abdel Fattah al-Sisi to attend the Arab-European summit to be held in Sharm El-Sheikh at the end of this month. . The President of the Republic, Ambassador «greetings to his brother the President of the Sisi», expressing «gratitude for this generous invitation». During the meeting, they reviewed the relations between the two brotherly countries and means of developing them, and the latest developments in the Arab and international situations. In another meeting, the President of the Republic, upon receiving Norwegian Foreign Minister Ene Eriksson, noted that «Iraq is seriously looking forward to opening up its Arab and international environment and developing its bilateral relations in order to achieve its growth and prosperity and rebuild its affected cities, especially after the victory over gangs supporting terrorism. Saleh stressed that «the transition from the stage of defeating terrorism to the stage of construction requires ending the crises experienced by the country and building the political system and reform and restore the citizen's confidence in his government, and this will not be achieved without the help of friends and friends and their support for political and economic reform», The international coalition against terrorism, which had clear support for Iraq ». For her part, Rice reiterated her country's support for the people and government of Iraq and to seek to develop relations between the two countries in the political, economic, oil and energy fields, expressing the willingness of Norwegian companies and businessmen to contribute to the reconstruction of the country. The President of the Republic also received the deputy head of the Kurdistan Regional Government, Qubad Talabani. 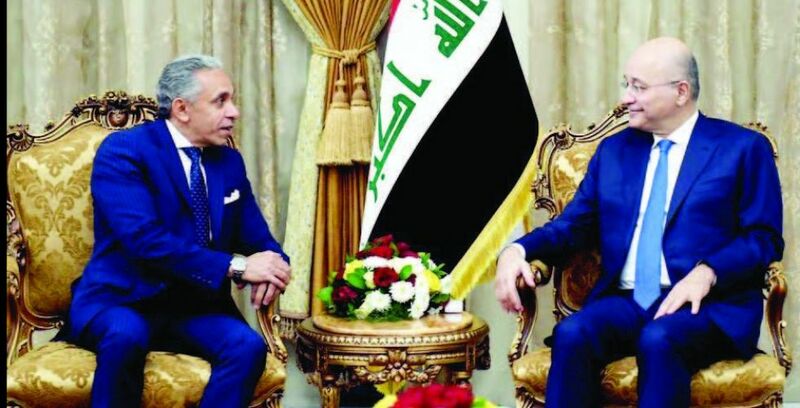 The meeting discussed developments in the situation in the country and the relationship between the federal government and the provincial government and ways to improve them and seek to combine all efforts in the interest of the Iraqi people, as well as discuss political developments at the Arab and international levels.